The plan brings Kaijonharju -Linnanmaa area into the 21st century with a new approach to self-sufficient society and social interaction. People are interacting in different public and semi-public locations: public squares, commercial areas and parks. This “citizen 2.0” will live in a productive city where they will share spaces and knowledge modifying themselves and the city so that the city can grow around the people. The most important meeting places are the chain of squares and commercial services reaching from the campus to the existing library / youth house, as well as the new amfi plaza, and a public sauna by the Pyykösjärvi lake. The plan brings a lot of new residents to the area thus supporting a wide range of services. 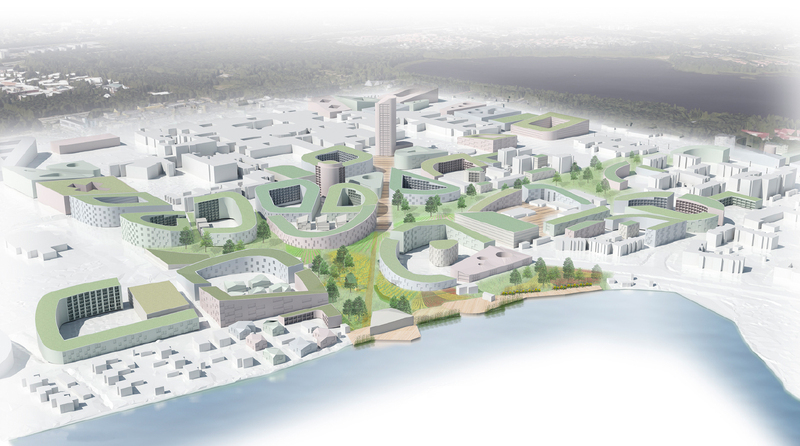 The plan connects the rectangular grids of the University campus side and the old Kaijonharju residential side with a new, organic city structure. In the middle of the new blocks there is a continuous public green area that connects the two lakes. Functions in the green area vary from play areas and natural forests to urban farming. The green area is made more usable and coherent by disconnecting the sub-urban Alakyläntie and introducing an urban, pedestrian friendly Amfikatu. The large green area forms a recreational core and an easy pedestrian connection between different parts of the plan. The green network is divided into smaller, easily reachable areas between the blocks. The new blocks form naturally flowing clear borders to the green areas. 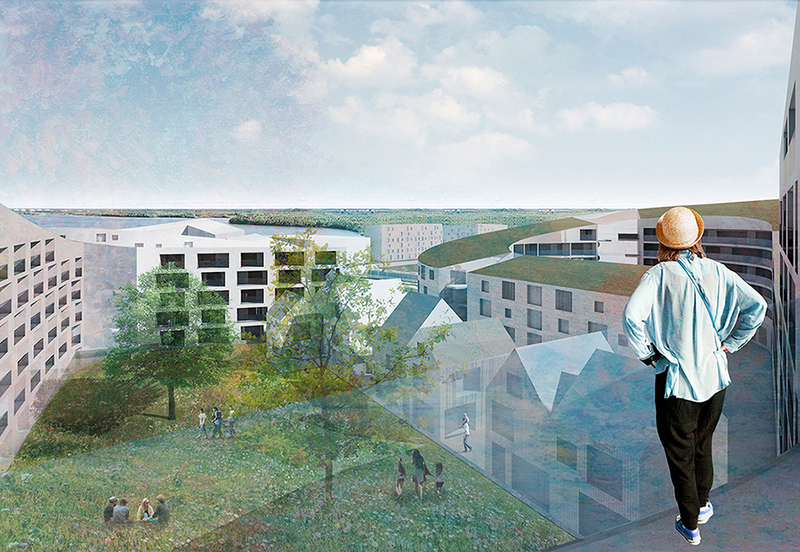 The most visible urban element is the new hybrid landmark tower by the campus and the view from the tower to the Pyykösjärvi lake and the new public sauna. 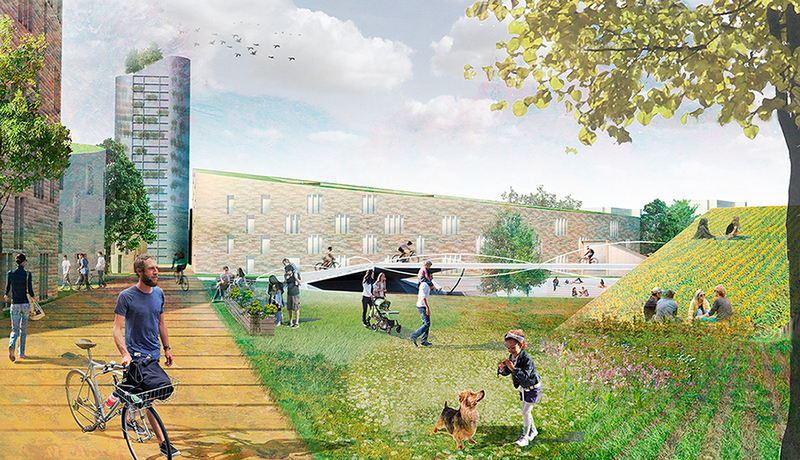 The blocks are organic in shape and create sheltered inner yards that encourage social interaction, gather people flow and maximize the lake views. Each block consists of different types of housing; regular housing, supported housing, student housing and housing for elderly people. The different types share common spaces. That way there are fewer,but better-quality spaces that gather people from different age and social groups. A special adaptation for usability and production is a vertical garden that functions as gathering and working space and provides a sheltered outdoor-like space. The larger blocks are divided into smaller units with “back alleys”. Along the alleys there are studio houses which offer workshops and spaces for different kind of small production.